When people think of the words disabled access, their minds will mostly think of those with physical disabilities such as those in wheelchairs and sight or hearing impaired. In Australia, the majority of people with disability have a physical disability (83.9%), while 11.3% have mental and behavioural disability and 4.8% have an intellectual or developmental disability. A disability is when an impairment or condition impacts on our daily activities, communication and/or mobility, and has lasted or is likely to last 6 months or more. Through Government policy and education, disability bias in the workplace is becoming less each year. Although there is a long way to go, more now than ever before, employers are looking past a candidate’s disability and concentrating on their ability, knowledge, and skill. In addition to ethical and moral policies on workplace diversity, there are also practical considerations within the office environment to consider when hiring and employing staff with a disability. The expertise of your office fit out company can literally save you tens of thousands of dollars and create a harmonious accessible workplace. Whether designing an office fit out from scratch, refurbishing, expanding or downsizing, there are three major reasons why office fit outs should have disabled access. AS1428.1 2009 Design for access and mobility provides the general requirements for disabled access in all new building work. The latest revision of the standard is mandatory and is very specific in its requirements. Below I have listed some of the basic design considerations of any office fit out. Circulation space around doors. Depending on the approach direction of any doorway there is an “exclusion zone” which must be kept clear. There must be a 30% luminance contrast between the wall and the door. Even the toilet seat has to have a 30% luminance contrast to the background to assist people who are visually impaired. Passing spaces are required when corridors exceed a set distance, and corners of corridors need to have enough room to allow for a wheelchair to comfortably turn in them. In addition to the above, The Equal Opportunity Act 2010 states that employers must make reasonable adjustments for a person offered employment, or to an existing employee with disability, to enable them to perform the genuine and reasonable requirements of the job. At Apex Executive Interiors, we go above and beyond the basic compliance to the laws and regulations for designing and building accessible office spaces. Why should anyone feel excluded or different in the workplace? We ensure that your office fit out will be compliant, accessible and workable for anyone regardless of their disability. All modifications and adaptations are inconspicuous and inclusive. Although some people are born with a disability, many people acquire a disability. 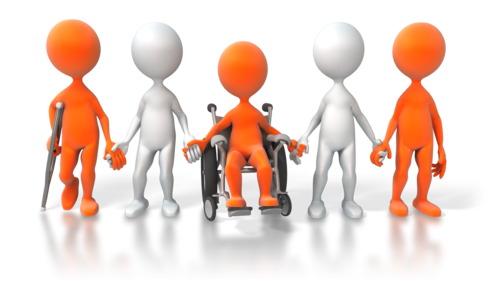 A person may acquire a disability through a workplace incident a car accident or develop a disability as they age. Imagine if the COO of your organisation was heli-skiing and spectacularly crashed to crush his or her foot? Although a macabre vision – it certainly is a possibility. Now imagine that the COO is wheelchair bound for 12 months whilst they endure multiple surgeries. When your office already has disabled access you can easily accommodate your COO’s new disability. Because your office is accessible, you don’t have to face the cost of an expensive remodel or retrofit or even worse the prospect of losing your COO for a while. In an alternate scenario, you are looking to hire a top human resources director. It is altogether likely that amongst your shortlist will be a potential employee with a disability. You need to know that there is nothing in your office impeding the hiring of any new employee. It simply makes good business sense to be accessible for all staff regardless of their disability. Check out our case studies for more detailed information of projects we have completed.